Tone 6 offers the Peak Energy of Momentum through a rhythm and pattern of movement. The Energy of Tone 6 is compared to a great athlete. On Tone 6, all our Spiritual Resources are drawn together to generate a Flow of Spiritual Movement. Star/LAMAT reflects Human’s identity as a Personification of Light. We are made of stars and return as stars in the realm of Spirit. LAMAT is a symbol of Venus, which shines as both the Morning and Evening Star. The Tzolk’in draws upon the cycles of Venus. Venus reflects our own cycles of “Dark” and “Light.” As the Morning Star, we are Closest to the Creator, existing in the Light of Illumination. As the Evening Star, we exist in Darkness, able to see our own Light. 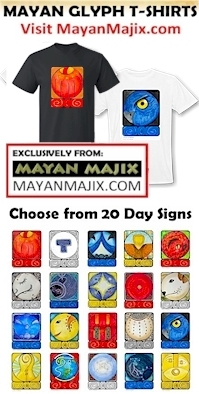 LAMAT’s totem is the Rabbit, the Cherokee Day Sign. Star/LAMAT is a day of “pure luck.” LAMAT is associated with the Power of Instant Manifestation. Whatever is focused upon will be Multiplied to Abundance. STAR/LAMAT: Reproduction and multiplication to abundance; identifying as the Personification of Light; responsibility to focus on what we want, not what we don’t want; love that flows freely in every direction. YELLOW: The color of completion; in the rotation of the 4 directions, Yellow is the final color in the set of 4. Yellow symbolizes a day of seating the beginning of an experience that will be initiated (Red) into a new and higher level of understanding. LAMAT’s “pure luck” is a Great Blessing and an equally Great Responsibility. 5 Deer/MANIK shared its most important Spiritual Tool, Vigilant Consciousness. LAMAT shows us that when we employ our Spiritual Tools, Creation is Easy. Tone 6 engages us in the Flow of Creation. All we have to do to manifest our Dreams is hold the Vision of its Creation in our Imagination. It’s easy, but requires Vigilant Consciousness. What we create in Spirit takes time to Manifest on Earth. Ether is transformed in a moment. Matter takes time. In the 10th uinal of Manifestation, we are drawn by the Peak Energy of Performance for the Intention of our Creation. The Rabbit will Multiply our Dream to Abundance. All we have to do is keep turning from the Darkness to the Light. Rabbit’s energy can feel a little vulnerable and jumpy. Our thoughts may bounce all over the place. This is a day to call on Divine Intervention. We can place our Dream in the Creator’s Hands early in the morning, as the offering of our Free Will. We can ask that a Divine Agency remember the Intention on our behalf. Star/LAMAT calls us to shine our own Light. The glyph marks the 4 directions to illustrate that our Light was meant to shine equally in all directions. The 4-square “star” in the center is related to the hole made in the ground by a hoe, where a Seed is Planted. We are each given our own Light and our own Place to shine. Tone 6 guides us to “go with the flow.” We don’t have to force our Intention, but allow it to unfold. This is the “Peak Energy” of the trecena that will carry us to the top of the pyramid and complete the work of a new Spiritual Climb. To all my relations, may we go with the Flow by allowing Everything to Be. May we turn from the darkness by Believing in the Purpose of each moment of our journey. May we allow the Dance of our Spirit to Be, believing in the Power of Divine Intervention. Galactic Tone 6: Flow. Six is responsiveness, and the art of negotiation. It is the movement of volume through space that creates time. This energy in action is like the art of dance or a great athlete in motion. Six facilitates dynamic developments in all aspects of life. I received my new passport! My Leap of Faith to buy the ticket before receiving it paid off. 🙂 The reality is starting to set in. I’m excited to carry you with me. I know what a healing it will be to see I’m just as capable as I have always been to charge off into the unknown for the experience. (Monkey must be talking.) I couldn’t be doing this without you.